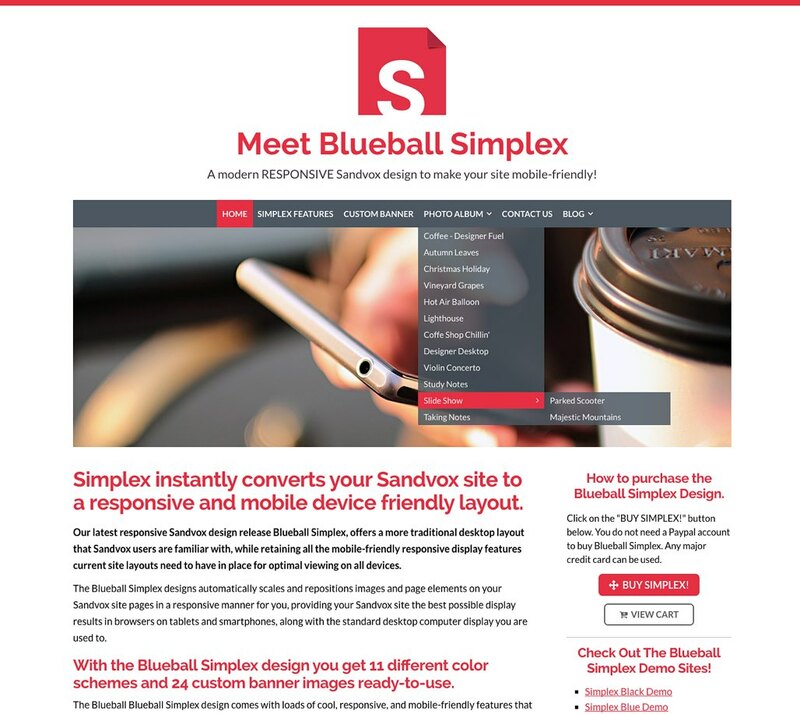 » New Blueball Simplex Responsive Mobile Friendly Design Released! New Blueball Simplex Responsive Mobile Friendly Design Released! I am proud to announce the release of our latest and finest responsive "mobile-friendly" Sandvox design - Blueball Simplex! 11 great color schemes (includes a dark version too)! Uses a single banner image that scales down in full with no cropping! Multi-level desktop and mobile nav mens! 12 custom Google font styles to use! Wide default max page width of 1200px! Excellent desktop AND mobile browser support! Detailed user guide and customizing guide with custom font examples and banner images listing! Let us know what you think about our Blueball Simplex design, and any questions you may have on it features. Let us know when you publish your Blueball Simplex site too so we can check it out. Many thanks for your continued support of our Sandvox designs! It is very much appreciated. Re: New Blueball Simplex Responsive Mobile Friendly Design Released! If you were one of the first buyers of the Blueball Simplex design, we made a simple mistake of saving the incorrect file for the customizing_blueball_simplex_v1.pdf file. This has been corrected now in the product listing and on the Simplex demo sites. You can either download your Blueball Simplex product again to get the correct file, use the link for it in the sidebar of any of the Blueball Simplex demo sites to download it, or email us direct and we will be happy to send it to you. My apologies for any confusion that this mistake may have caused anyone. Terrific, Charlie. Looked, bought, and am fiddling with customization now! An excellent new design. On Monday I'll go looking for a client to use it on! LOL.